Around 1.4 crore people in Punjab voted for their 117-member assembly today. Some 1,100 candidates had their fates sealed in the crucial election that saw a three-way contest between the ruling Akali Dal-BJP alliance, the Congress and the Aam Aadmi Party, which debuted in the state polls this time. The 2017 Punjab elections saw several high-octane contests with incumbent Chief Minister Parkash Singh Badal taking on his predecessor, Congress' Amarinder Singh, in the former's constituency of Lambi, and AAP lawmaker Bhagwant Mann challenging Akali Dal chief Sukhbir Singh Badal for the latter's Jalalabad seat. Former BJP lawmaker Navjot Singh Sidhu also contested as a Congress candidate from Amritsar East. The Congress seeks to regain the state from the SAD-BJP alliance, which has ruled Punjab for nearly a decade, while the AAP - which won all of its four Lok Sabha seats in 2014 from the state - expects to make a smashing foray. Join Dr Prannoy Roy, Dorab Sopariwala and Shekhar Gupta as they identify and analyse the issues and mood of the voters from Punjab. Prannoy Roy: A fascinating election to cover, one of the best I have ever done. Could this be the end of polling here too after Brexit, and US? Prannoy Roy: So we went on a trip across the state. 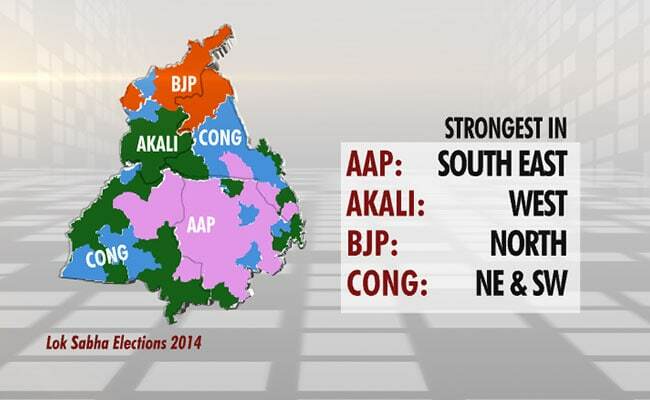 Now we are in one the 'predictor constituencies' Bassi Pathana, which seem to always pick the winner. So here is our forecast after speaking to hundreds of people. 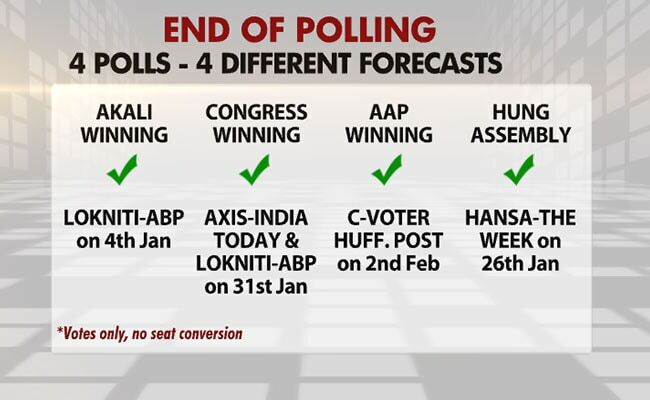 Our first forecast said Congress had best chance, now we say AAP has 55-60% chance of winning. 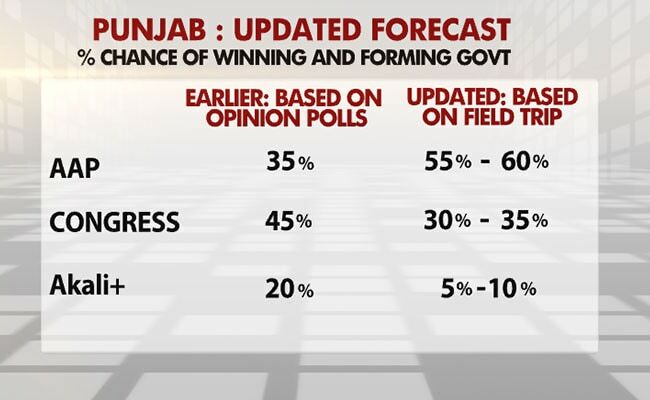 Our first estimates were based on studying opinion polls but now we have gone around the state and spoken to more people and based on these inputs, this is what we conclude. Shekhar Gupta: Nobody is shy to say they are voting for change. Prannoy Roy: Where is the AAP is going to get its vote from? AAP takes a lot of the Akali foundation away. 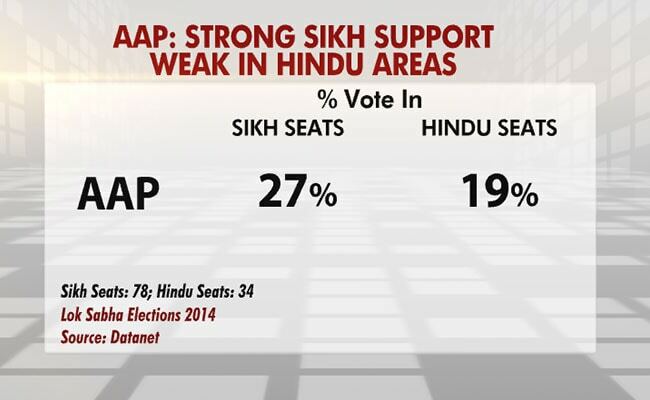 AAP is weaker in Hindu areas, strong in Sikh areas. It did very well in East Malwa region. Here's how the political parties map looks like. Shekhar Gupta: This is a very impatient electorate. 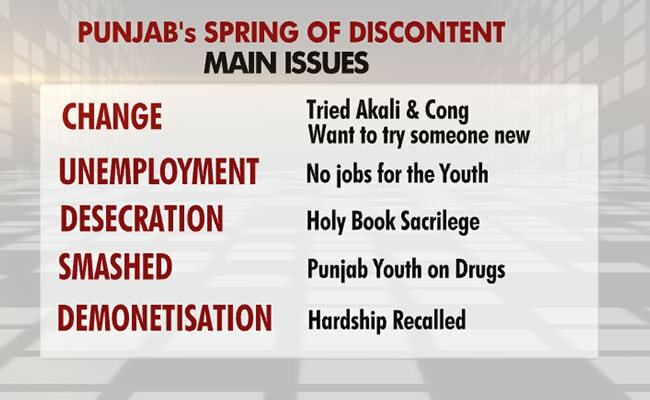 Another reason for Akali's collapse is that over the past 10 years, it has transformed from a democratic party to a dynastic party. The incidents of desecration and the fact that the guilty weren't caught angered the public. Dorab Sopariwala: For the first time, I saw signs of despair in Punjab. 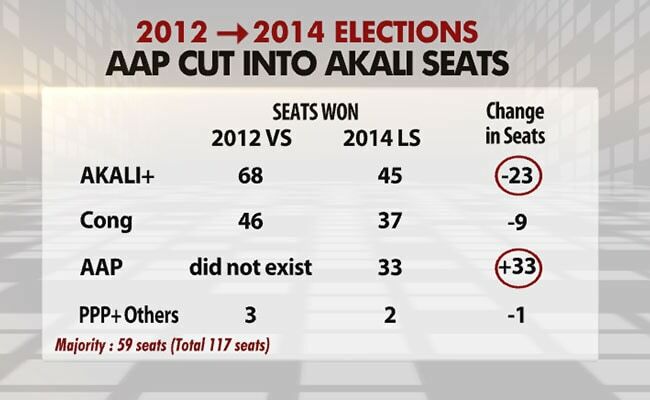 Many people are voting for AAP are saying, "What do we have to lose?" Shekhar Gupta: But this despair is not for destitution though. It's for jobs and other issues. Shekhar Gupta: For many people, voting for AAP is a gamble. They are willing to take a risk. 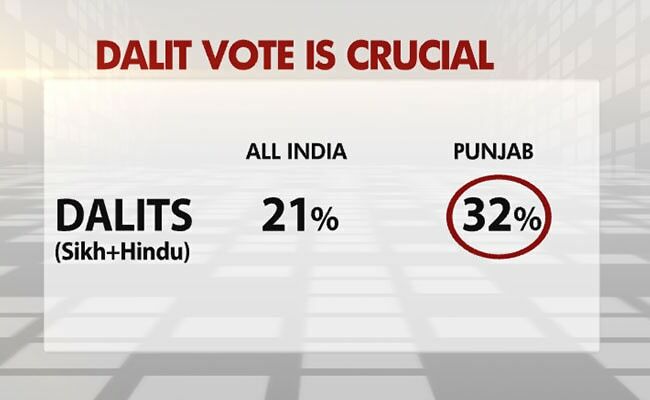 Prannoy Roy: Another important factor in Punjab is the Dalit vote because they form a large part of the population. 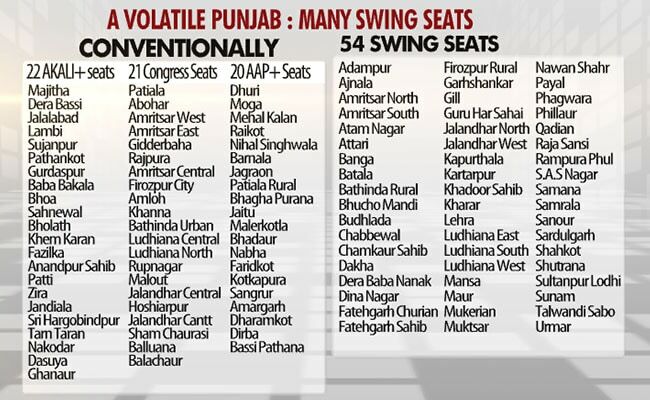 Prannoy Roy: That's why there are 54 swing seats - very few seats are safe. Shekhar Gupta: There is resentment about one family's rule in Punjab. Prannoy Roy: People seem to trust Kejriwal. A party without a leader has come so ahead. Shekhar Gupta: AAP has gone beyond the identity. People don't care who is the party chief or who will be the chief minister, they are voting for issues. Shekhar Gupta: This election is about a CRY - Change, Revolt and Youth. 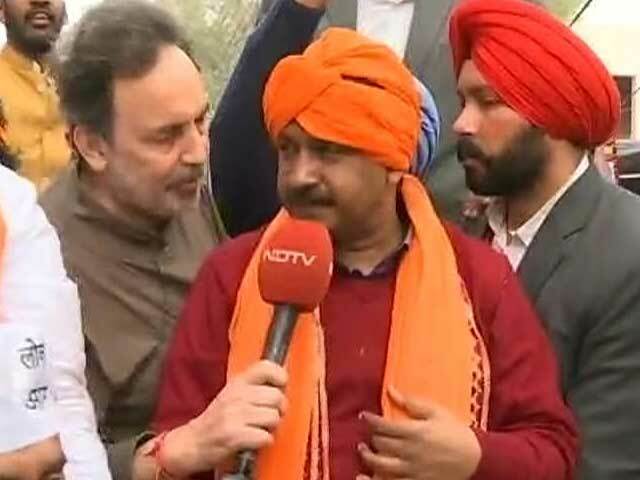 Prannoy Roy to Arvind Kejriwal: How many seats will you win? 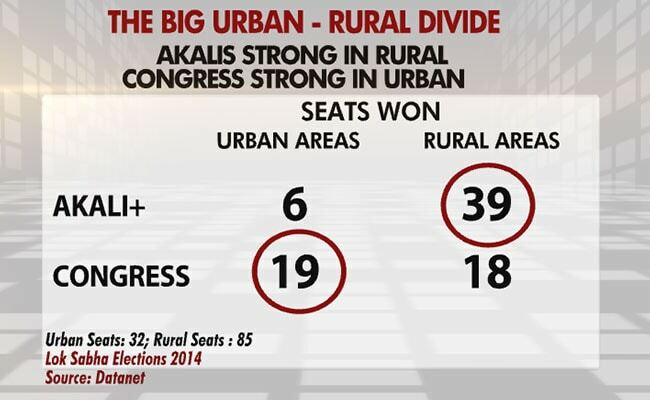 Arvind Kejriwal: More than 100 seats. Dorab Sopariwala: It isn't just a support for AAP. It's a frenzy. Shekhar Gupta: AAP seems to have co-opted patriotism. They don't have their own iconography so they have invoked people like Bhagat Singh, Rajguru. Shekhar Gupta: I have not seen a Hindu leader get this kind of adulation in Punjab even counting Indira Gandhi in pre-Bhindranwale days. 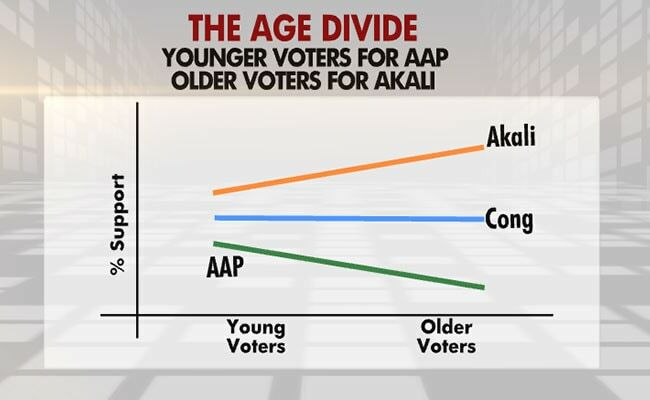 Prannoy Roy: So how does age divide, and the urban-rural divide affect the vote? Prannoy Roy: People are saying there is a huge wave for the AAP in the pind or the villages but in cities there is still respect for the Congress. 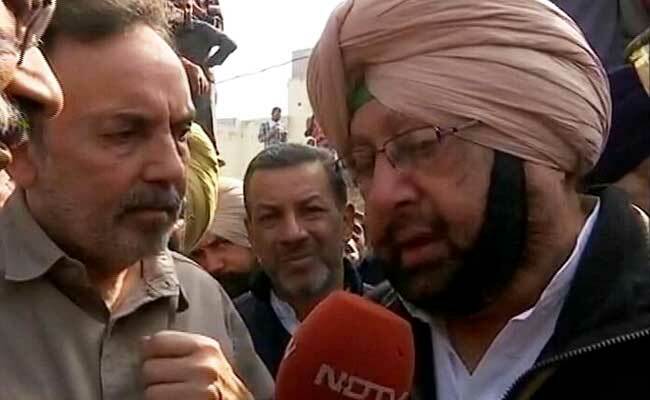 Amarinder Singh to NDTV: AAP is not a problem for us. They were a problem two years ago when they were new, but their magic seems to have worn off as people have seen their functioning in Delhi. Sonia Gandhi is not Sikh but she made a Sikh party president here. AAP could have done that. AAP's support comes not from Sikhs but from youth. Youth is frustrated, they want change, a new alternative. If I don't win, this is my last election. I have said that before. I am 75. 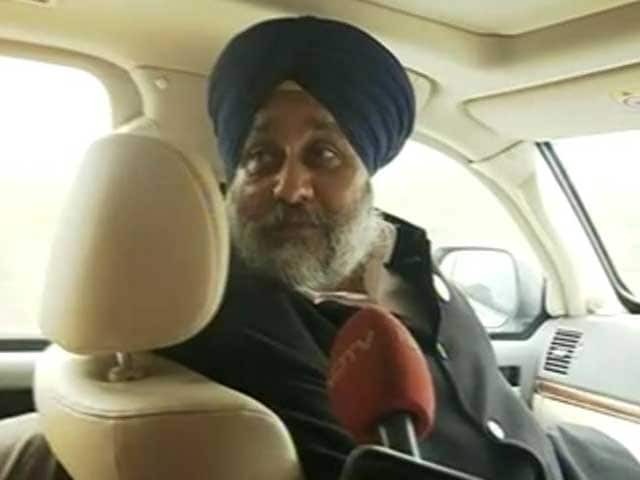 Sukhbir Singh Badal to NDTV: This a true story about us. We are not like Kejriwal who says something and does something else. Why I say Kejriwal is a useless and dangerous character is because we have been through very bad terrorism. The people who are responsible are the people he is meeting. He is meeting people of Babbar Khalsa. International people have breakfast with them because he wants to be a Chief Minister, so that he can get after PM Modi. His mission is only Modi. He just wants to attack Mr Modi and wants that if I do that, I will become a national figure. (If AAP wins) It will be the worst thing in the history of Punjab because all criminal elements, all forces which are responsible to bring them to power will go back with them. Captain Amarinder Singh will be number 3 in that (Lambi) constituency. Parkash Singh Badal will win with a majority of more 35,000 votes. Captain will be number 3. 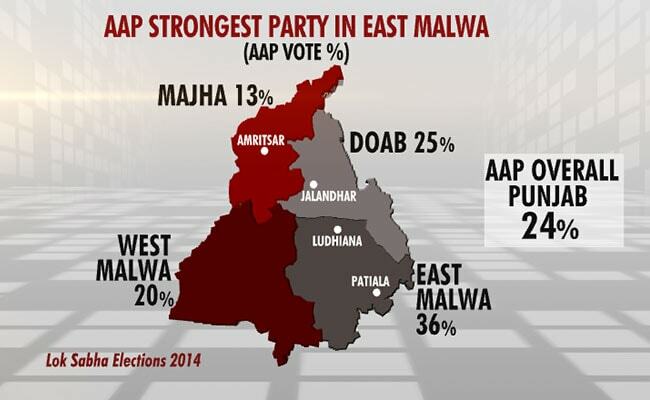 Prannoy Roy: Going by the trends, there seems to be a victory for AAP. The question is - will it be a landslide.